The renaissance of scene design began in Italy. Sebastiano Serlio, in his Architettura, Book II (1545), interpreted what he thought were classic ideas on perspective and the periaktoi and published the first designs on the definitive types of sets to be used—for tragedy, palaces; for comedy, street scenes; for satyr plays, the countryside. 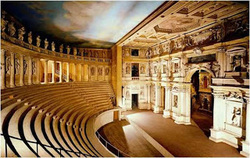 The first permanent theater in Italy, the Teatro Olimpico at Vicenza (1584), was an attempt to recreate the Roman scaenae frons with five permanent perspectives.